Italian wine is what this blog is all about right? Then today’s blog is going to go through the fundamentals of Italian wine. When was Italian wine first producer? Who is the most important producer of Italian wine? Who drinks the most Italian wine? Italy has been producing wine as far back as records show. The ancient Etruscans were the first to plant vines but it fell to the Romans to create an Italian wine superpower. At the height of their powers most of Italy was planted with vines and they had created a blueprint for the current Italian winescape. Almost all the areas where we currently find wine were already producing 2000 years ago. The Romans embraced wine more than any other civilisation and wine was drunk daily in all walks of life. 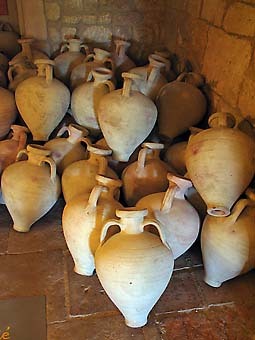 Roman wine was stored and traded in giant amphorae (SEE ABOVE). They even knew the secrets of ageing wine with records from the time showing how aged wine was preferred and more expensive. During Roman times the greatest and most exclusive vineyards were in the vicinity of Rome and ran along a strip southwards to Naples following the Via Appia. As the empire expanded, trade routes opened and roman roads took hold allowing greater access to the whole of Italy and mainland Europe. Vineyards in Tuscany and the Veneto began to catch up with wines from around the capital and the great Augustus would today have been an Amarone fan as he favoured the wines of the Veneto. When Rome fell and Italy was awash with Barbarians it saw the end of fine wines for an extended period although the vineyards did not fall into disuse. The luxurious Roman lifestyle was gone and wine was treated as a beverage and not a commodity. In the middle ages there was less exporting of wines, even internally, and the citizens of Rome would drink wine produced within a certain radius of the capital. In the 14th century Italy began once more to find her feet. The population doubled and many moved into the cities creating booming city states. There formed an elite, educated class who went on to create fabulous cathedrals, fountains and monuments. Italy was divided into city states with Venice being the most important. This was a time of philosophers, merchants, explorers and painters and such fine people need great wine! The famous Florentine banking family, the Antinori’s, decided to diversify and went into the wine trade. Today Antinori’s vineyards are still the most celebrated in Italy producing such brilliant wines as the Tignanello, Solaia and Guado al Tasso. It was during this time that fine wines became seen as a symbol of status and the perfection of viticulture; a passion. Skipping forward to today, we can consider Antinori to be the most important wine producer in Italian history but the House of Antinori is not the most important wine producer of today. That honour falls to Angelo Gaja. Who is the most important producer of Italian wine? Angelo Gaja gets it. Italian wine makers are generally not the most commercially aggressive creatures and neither are the powers that be within the Italian system. Horrified that Italians have begun exploring the wines of France, Australia and even, (the shame), California, the Italian producers need to step up their game to keep their home market. Italy has fallen to 5th in the UKs favourite wine market tables and all looks rather bleak. Step forth Angelo Gaja. Gaja is on a one man mission to revitalise Italian wine. He works tirelessly promoting his brands at home and abroad and has a cult following. A poignant note in the history of Gaja is the example of his Darmagi wine. Darmagi in Italian means “shame”, this was the words uttered to Gaja from his grandfather when he experimented with Cabernet Sauvignon grapes in his Piedmont vineyards. These experiments set the scene for Gaja vineyards across the Piedmont and Tuscany and today Gaja produces the finest blended wines in the country. They may be inspired by Bordeaux but they are made with Italian flair and show the importance of Italy’s terroir. In honour of Signor Gaja, today’s tasting note will be for his Darmagi. Who drinks the most Italian wine? Well, it might surprise you but actually Italy drinks the vast majority of it. However after this we can count on four other markets. Germany is a huge importer of Italian wine. Anyone in the wine business will know of the famous wholesalers and excellent websites that sell Italian wine. German Ebay also has a glut of Italian wine daily and if you live in Germany you have to check this out as many great wines are going for less than I can buy here in Italy. Next on the list is France, if Germany was a shock in top spot then France in second is even more bizarre. There is no love lost between these two great rivals but it seems the French buyers like to dabble with Italian wine, importing over 5 million hectolitres a year. Way behind but in third is the USA. This is the fastest growing market for Italian exports and while the Americans don’t drink anywhere near as much wine as they do beer, Italian wine is their #1 imported wine! I always said the Americans were a nation of supreme taste! Trailing in fourth, my home nation, the British. We have no real wine of our own and our love affair with claret continues but Italian wine is falling way behind, Australian, California and now Chilean imports! It might be the fifth largest importer but still over 1 million hectolitres a year make their way to British shores. What has been the worst bottle of wine you have drunk all year? Hi SarahV.Informative and I now feel very wise.The worst wine I’ve had all year is a Taurasi, can not remember the producer and would rather forget. Just discovered this blog today, very interesting though I can’t afford Darmagi. Anything cheaper for us paupers? Nope, no where sells it! Save up for the Gaja or check tomorrow I’ll try to post some cheapies. Ha@JoshThat’s rude to bash your host. Absolutely the worst?2006 Mollydooker Boxer. Very interesting to read the history on Italian wine, thanks for making it short and snappy. Worst wine of the year has to be the 2006 Mollydooker Boxer recommended by Wine Spectator magazine in September so I rushed out an bought a case. It really sucked a$$. Interesting blog, informative, witty and different.